Those were marvelous and fragrant flowers that once inspired the French iconic designer Christian Dior to bring into existence poppy-shaped or bluebell-imitating exquisite gowns dreaming of Parisian streets exhaling realistic sumptuous flower-women. Since then flowers with their fragility and subtlety have been tenderly touching Christian Dior’s all collections, including the brand-new Dior spring/summer 2016 collection just unveiled under the patronage of the talented Belgian designer Raf Simons, who has always been so fervent to preserve the iconic Christian Dior style in all his collections. He has actually outperformed the house’s previous flower fancier. Not only were the models spreading out some floral subtlety and out-of-this-world vibes, but also the center of the Louvre’s Cour Carrée, where the ethereal runway show was held ” literally floral drenched, just in case you have ignored that part. Raf Simons in collaboration with landscape artist Eric Chauvin had made a real mountain covered with 400,000 delphiniums to decorate the runway for his spring show. Exactly like in a fairy tale the mountain’s magic door opened and inundated the location with a squad of sweet and gentle fairies. Magic sticks were lamentably missing; Raf Simons should have cared about our cherished dreams. 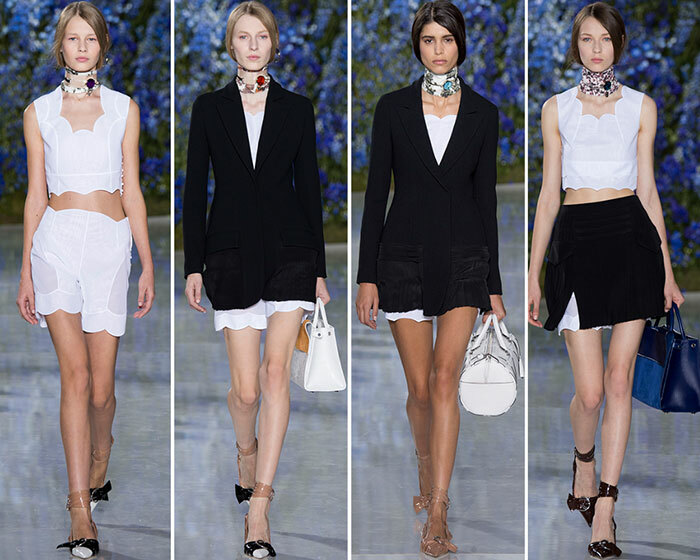 The beginning of the Dior spring 2016 runway show seemingly opened the magic door and drew a classic grand piano. The runway was savoring black and white classic garments, a classicism impregnated with springtime atmosphere and flower petals. The show opened an all-white shorts suit, the hems of which were mimicking tender floral petals, a structure that stretched along the whole show. Flower petals were embellishing a range of semi sheer organza crop tops, lightweight dresses and shorts. Dior’s signature Bar jackets will never go to archive especially when Raf Simons is conversant with the right techniques when it comes to breathing a new life into the iconic jackets and making them ultra-modern and up-to-the-minute. All-black blazers and vests were effectively styled with tiered ruffles at the hems matched with white pieces as if to emphasize that classic style would never get along in years even in spring full of colors. All black pantsuits would have conveyed strictness advertising rigorous women if not those romantic and frivolous crop tops worn under the boxy blazers. 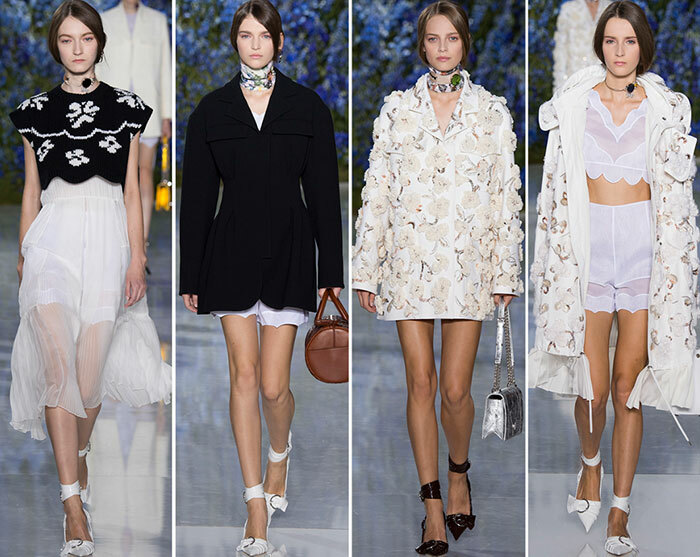 However what made the Dior show and what was perfectly going with the blooming mountain were those ethereal and demurely diaphanous minis or maxi overlays with petal-like cutouts at the hems at times coming to be of high-low shapes with a frothy tail gently floating in the air or matched with knitted crop tops with oversized shoulders. 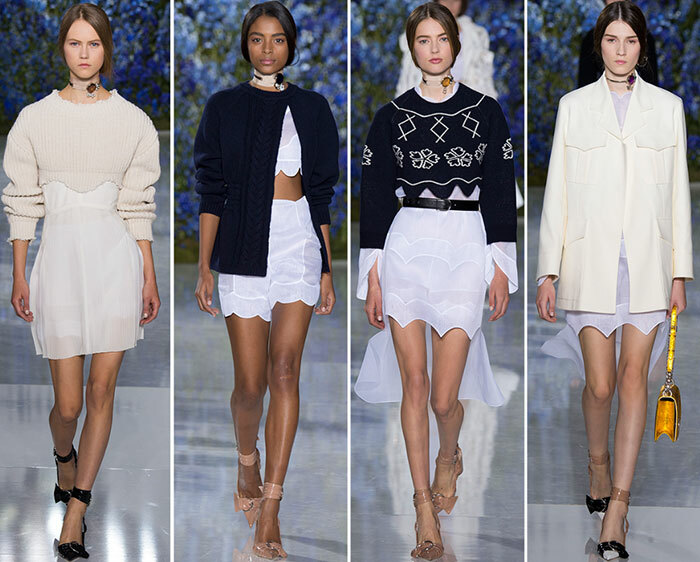 Actually, the knitted crop-tops of navy blue, powder blue and Magenta pink shades will apparently lead Raf Simons to the large repository of spring 2016 trendsetters mainly due to their oversized and sometimes even mega oversized cocoon-shaped sleeves that were visually making petite ladies broad-shouldered and strong. 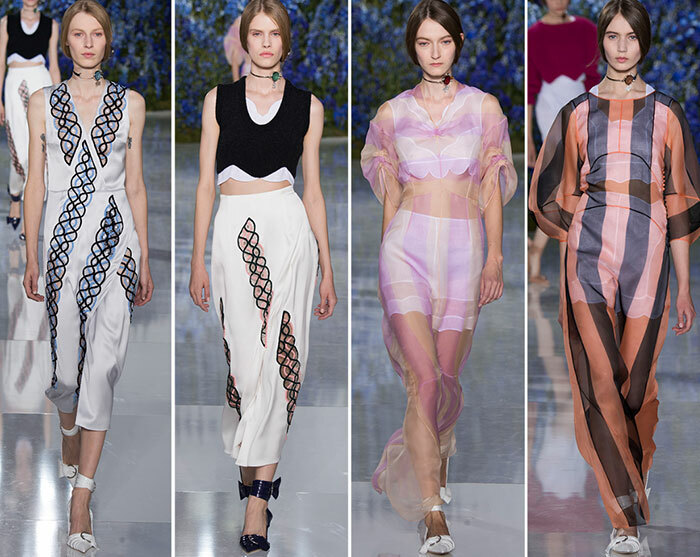 All in all, the Dior spring 2016 lineup felt futuristic and minimalistic, almost devoid of motifs, patterns and glittering details. A couple of trenches were patterned with black-red and black-pink stripes while a few silk separates were adorned with some zigzag-shape or foamy panels. The Christian Dior woman seems to be on the verge of her metamorphosis, ready to leave behind that na‚Äö√†√∂‚àö√≤ve fairy lady becoming a sensual wise woman. The process was definitely accelerating with those daring ankle-strap mules with pointed toes and romantic scarves tightly fastened around the necks then unexpectedly turning into necklaces when a glittering stone was attached to them.